The A's and Mariners may have played a couple official games in Japan last week but for most fans, yesterday marked the opening day for the 2019 baseball season. 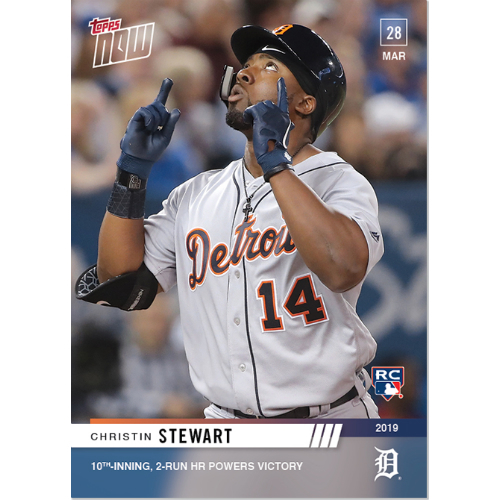 Topps commemorated a few highlights from the day's games with today's batch of Topps Now trading cards. A complete checklist for the series can be found under the main tab of this hub which includes final print runs for this wave of cards. 11 - Robinson Cano (New York Mets). Cano hit a home run in his first at bat for the Mets and an RBI later in the game would provide the second of the team's runs for the day. This is the first card of the season for Cano. 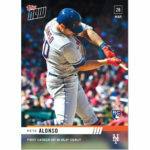 12 - Pete Alonso (New York Mets). 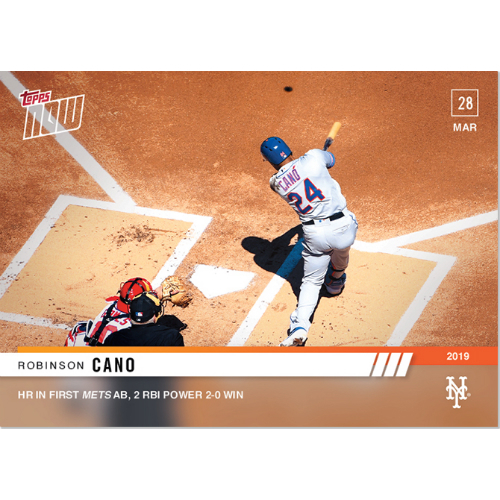 One would think with Cano providing all of the Mets' runs for the game that he'd be the only card for the team but, in fact, Alonso had a milestone with his first big league hit in the eighth inning of his first game. 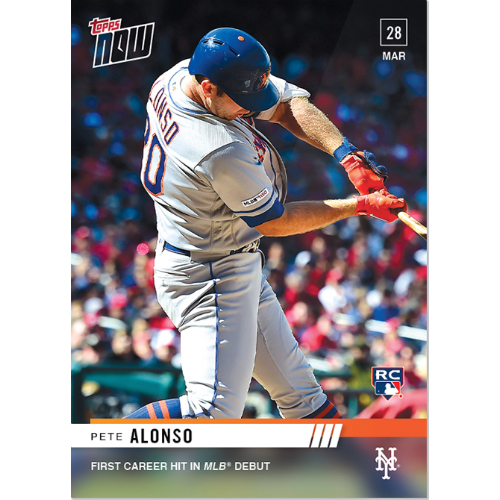 This is Alonso's first Now card of the season. 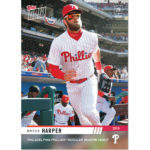 13 - Bryce Harper (Philadelphia Phillies). When you're an off-season story as massive as Harper, your debut with a team is enough to warrant a card. He didn't score his first hit for the Phillies but did reach base on a walk and score one of the team's 10 runs for the day. This card also comes with four relic parallels. It is the second Harper card to appear in the 2019 line (ST3). 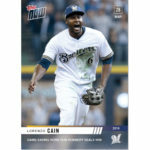 14 - Lorenzo Cain (Milwaukee Brewers). Cain saved the day for the Brew Crew with a leaping steal of a game-tying home run in the ninth inning. This is the first Now card Cain has received in 2019. 15 - Christin Stewart (Detroit Tigers). The Detroit rookie decided the team's opening day fate with a two run blast in the 10th inning. This is his first Now card of the season. 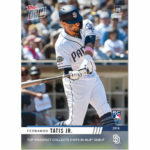 16 - Fernando Tatis Jr.(San Diego Padres). Tatis went 2 for 3 in his major league debut. 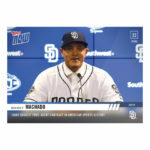 His start at shortstop made him the youngest opening day starter since Adrian Beltre in 1999. This card includes several parallels, all of which are autographed relic cards. 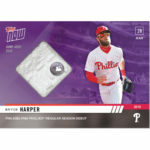 Six cards include a base relic and three cards include a baseball relic. 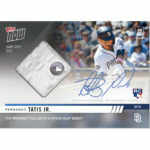 This is the first Now card for Tatis this season. 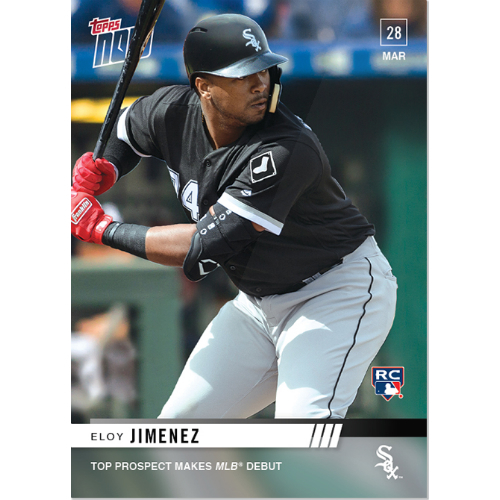 17 - Eloy Jimenez (Chicago White Sox). Jimenez made his major league debut on Opening Day this year, scoring his first RBI and run. This card includes a set of autographed relic cards. It is the first card of the season for Jimenez. 18 - George Springer (Houston Astros). 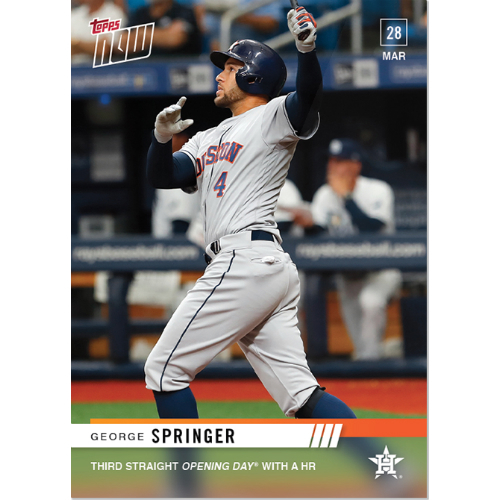 Springer is no stranger to Topps Now cards and his first of the 2019 campaign highlights a towering feat -- three consecutive opening day home runs. This year's homer was a three-run go-ahead off of Blake Snell that helped the Astros defeat the Rays. 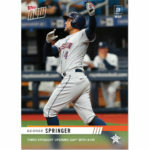 This is Springer's first of many Topps Now cards this season. 19 - Los Angeles Dodgers. It was derby day in Los Angeles as the Dodgers set an MLB record with eight home runs in their Opening Day game. The team would go on to beat the Diamondbacks 12-5 thanks to two homers from Joc Pederson and Enrique Hernandez as well four more split among Austin Barnes, Cody Bellinger, Max Muncy, and Corey Seager. This is the first Dodgers team card and first card representing the team for the 2019 season. Each card is available for 24 hours. You can use the links on this page to purchase your copy or, if time has expired, find the cards on eBay through our checklist. 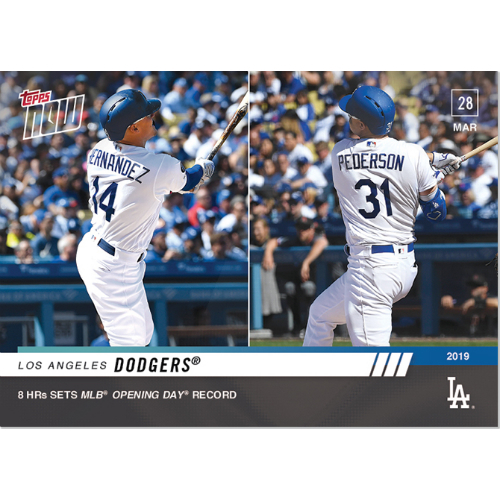 Final print runs are added to our checklist as soon as Topps announces them.